Donald Trump claimed his place on Wednesday as America's 45th president, an astonishing victory for the celebrity businessman and political novice who capitalised on voters' economic anxieties, took advantage of racial tensions and overcame a string of sexual assault allegations on his way to the White House. His triumph over Hillary Clinton, not declared until well after midnight, will end eight years of Democratic dominance of the White House and threatens to undo major achievements of President Barack Obama. Trump has pledged to act quickly to repeal Obama's landmark health care law, revoke America's nuclear agreement with Iran and rewrite important trade deals with other countries, particularly Mexico and Canada. As he claimed victory, Trump urged Americans to "come together as one united people" after a deeply divisive campaign. He said he had spoken by phone with Clinton and they had exchanged congratulations on a hard-fought race. Trump, who spent much of the campaign urging his supporters on as they chanted "lock her up," said the nation owed her "a major debt of gratitude" for her years of public service. Global stock markets and US stock futures plunged, reflecting investor concern over what a Trump presidency might mean for the economy and trade. A New York real estate developer who lives in a sparkling Manhattan high-rise, Trump forged a striking connection with white, working class Americans who feel left behind in a changing economy and diversifying country. He cast immigration, both from Latin America and the Middle East, as the root of the problems plaguing many Americans and tapped into fears of terrorism emanating at home and abroad. Trump will take office with Congress expected to be fully under Republican control. GOP Senate candidates fended off Democratic challengers in key states and appeared poised to keep the majority. Republicans also maintained their grip on the House. Trump upended years of political convention on his way to the White House, levelling harshly personal insults on his rivals, deeming Mexican immigrants rapists and murderers, and vowing to temporarily suspend Muslim immigration to the US. 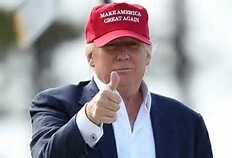 He never released his tax returns, breaking with decades of campaign tradition, and eschewed the kind of robust data and field efforts that helped Obama win two terms in the White House, relying instead on his large, free-wheeling rallies to energise supporters. His campaign was frequently in chaos, and he cycled through three campaign managers this year. His final campaign manager, Kellyanne Conway, touted the team's accomplishments as the final results rolled in, writing on Twitter that "rally crowds matter" and "we expanded the map". Clinton spent months warning voters that Trump was unfit and unqualified to be president. But the former senator and secretary of state struggled to articulate a clear rationale for her own candidacy. At 02:00, Clinton campaign chairperson John Podesta told the crowd to head home for the night. "We're still counting votes and every vote should count," he said. But she later conceded. Exit polls underscored the fractures: Women nationwide supported Clinton by a double-digit margin, while men were significantly more likely to back Trump. More than half of white voters backed the Republican, while nearly 9 in 10 black people and two-thirds of Hispanic people voted for the Democrat. Doug Ratliff, a 67-year-old businessman from Richlands, Virginia, said Trump's election was one of the happiest days of his life. "This county has had no hope," said Ratliff, who owns strip malls in an area badly beaten by the collapse of the coal industry. "Things will change. I know he's not going to be perfect. But he's got a heart. And he gives people hope." Trump has pledged to usher in a series of sweeping changes to US domestic and foreign policy: repealing Obama's signature health care law, though he has been vague on what he could replace it with; building a wall along the US-Mexico border, and suspending immigration from countries with terrorism ties. He's also praised Russian President Vladimir Putin and spoken of building a better relationship with Moscow, worrying some in his own party who fear he'll go easy on Putin's provocations. The Republican Party's tortured relationship with its nominee was evident right up to the end. Former President George W. Bush and wife Laura Bush declined to back Trump, instead selecting "none of the above" when they voted for president, according to spokesperson Freddy Ford. House Speaker Paul Ryan, a reluctant Trump supporter, called the businessman earlier in the evening to congratulate him, according to a Ryan spokesperson. Clinton asked voters to keep the White House in her party's hands for a third straight term. She cast herself as heir to President Obama's legacy and pledged to make good on his unfinished agenda, including passing immigration legislation, tightening restrictions on guns and tweaking his health care law. But she struggled throughout the race with persistent questions about her honesty and trustworthiness. Those troubles flared anew late in the race, when FBI Director James Comey announced a review of new emails from her tenure at the State Department. On Sunday, just two days before Election Day, Comey said there was nothing in the material to warrant criminal charges against Clinton.